When it occurred to me that James Potter, Harry’s eldest son, was due to start at Hogwarts I thought it was the perfect opportunity for someone to check out accessibility of the Hogwarts Express. The wizarding world is full of witches and wizards who fall under the definition of disabled as defined in the Equality Act (2010), specifically having “a physical or mental impairment that has a ‘substantial’ and ‘long-term’ negative effect on your ability to do normal daily activities.” Within Harry’s immediate circle there’s Alastor ‘Mad Eye’ Moody with his various physical impairments sustained as a result of his work as an Auror, Remus Lupin whose monthly battle with his transformation into a werewolf is a result of an infection, and of course Professor Flitwick’s height presents the same challenges in the wizarding world as in the muggle one, though magic provides the opportunity for many more interesting and innovative solutions than might otherwise be possible. I first approached the Ministry of Magic with an FOI request requesting information about disabled access to the train, but it quickly became clear that an assessment had never been made. Unable to supply the information, they reluctantly agreed to my request to check out the Hogwarts Express personally. I did ask for a Ministry car to take me to the station but this was declined under the new rules set up after what was described to me as the unfortunate incident involving a junior under-secretary, a horseshoe and a stick of celery. The official I was communicating with sadly refused to go into details. I was met efficiently at Earl’s Court, and headed down in the lift to catch the Piccadilly line to Kings Cross, which as regular readers will know is level access so I was easily able to board the train. As I settled down for the journey I noticed a family seated at the end of the carriage, almost obscured by the usual London collection of Chinese and European tourists with their collection of enormous hard shelled, wheeled suitcases in vibrant colours sporting LHR and LGW luggage tags. The family didn’t exactly stand out, and certainly weren’t set apart from London’s population of eclectic and sometimes frankly weird fashionistas, but there was something not quite right about their dress. The father’s green suit apparently from the late 70’s coupled with red Converse All Stars had the feel of a stylish Dr Who having somehow just missed the point. It was their luggage that was most out of place, a large brown travel trunk battered and worn through use, apparently held together with strong leather straps and a large brass padlock. Atop the upended trunk sat a woven wicker basket which, every few minutes, shook violently until the young boy reached over, put his hand on the lid and leaned in to whisper something through the hand hold cut into the basket’s side. I don’t know what was in the basket, but as the boy stepped away I could see one piercing red eye peering out of the hole. Disturbing. Looking around it was clear that all the other passengers were either unaware of or uninterested in the tableau that I was watching. We reached Kings Cross and I was not surprised that as I got off the train so did the family. The father dragged the trunk behind him exactly like a wheeled suitcase, except for the complete absence of wheels. Looking closer as I followed them down the platform I could see light between the trunk and the floor surface. The fact that this large and almost certainly very heavy piece of luggage was apparently floating seemed to go completely unnoticed to the teeming crowds all intent on reaching their own destinations. I headed to the lift, which was apparently their destination. They arrived before me, but even from this distance I could see the large ‘Out of Order’ notice stuck to the door. I cursed myself for not checking Up-Down-London and began to think about my options, but that was unnecessary. The father glanced quickly around, ripped the notice from the door and discarded the now screwed up paper. Reaching into his jacket he pulled out a dark brown stick which he touched, discretely, to the lift call button. Immediately the button lit up and, after a short pause, the doors opened to reveal a working lift. TfL REALLY need to employ magic in their lift maintenance team. Repairs would be much quicker and upgrades might not take six months. Although I tried to follow them up to Kings Cross, I somehow lost track of the family so I arrived onto the concourse facing the same dilemma Harry first had, how to find the train. I knew I was in the right place because the train was actually listed on the departure screen, but no platform was mentioned. Optimistically I asked one of the station staff for directions but she insisted on pointing me at the staged set for tourists and fans to take photos. This obviously wasn’t going to help me. I headed towards platform 9 in the hope of seeing something that might help, but all I could see was commuters and day tripping shoppers heading back and forwards to suburban trains. I headed back to the main concourse. Clearly there is a serious signposting problem within the station which is not only an issue for disabled people but for non disableds too. Similarly, the lack of any audio announcements is clearly unacceptable. Fortunately I caught a glimpse of a large bird cage sitting teetering on a pile of luggage being pushed on a trolley by a young, excited looking boy. I carved my way through the crowd following him through the ticket barrier. As we approached platform 4 a steady stream of families confirmed that I was in the right place. Amazingly none of the commuters seemed to notice as small groups of people disappeared into the wall between platforms 4 and 5. 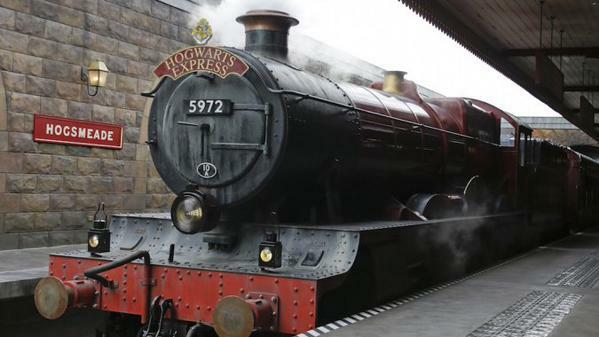 Clearly even the legendary Hogwarts Express is subject to the inconvenience of platform alterations. Apprehensively I joined the flow of people and wheeled into the wall with my eyes shut. Emerging onto the platform I saw the scene familiar to Potter fans everywhere, a crowded platform of parents, students, luggage, a zoos worth of animals, and of course, The Hogwarts Express itself. Obviously accessibility wasn’t even on the agenda when the old carriages were built. Out in the muggle world, my world, the only way to travel on these trains was in the draughty, cold guards van with all the luggage. (/pun alert) British Railways were never in the Vanguard of disability rights. I navigated my way through the melee without anyone giving me, someone who really shouldn’t be there, a second look. Standing at the back of the train I found the guard dressed in a traditional dark blue uniform and sporting a peeked cap, idly passing time, waiting for departure as various porters and parents loaded large trunks in to the train through the large open door. In a strange contrast to the obviously magical atmosphere, he was tapping away on a mobile phone, apparently tweeting as so many railway personnel do. I wondered if he was updating J.K. Rowling on how the young James was coping. Clearly social media has even seeped into the wizarding world. The Guard looked up and smiled, obviously expecting me. I hadn’t booked assistance, I’m not even sure the Express has the 24 hours’ notice policy so beloved of National Rail companies. If it does I’m reasonably sure it’s not part of the national assistance programme otherwise the staff on the main Kings Cross concourse would surely not have been so hopeless at offering help. Maybe the Ministry had had a word, or maybe Professor Trelawney had unexpectedly earned her keep, either way he stepped forward to greet me. I’d expected him to go off in search of a ramp as happens every day across the muggle rail network, but instead he just pointed me at one of the narrow doors into the main part of the train. Sceptically I approached and was amazed but delighted to watch the steps up to the carriage flatten and extend to become a ramp. Certainly this is mechanically possible with modern technology so magic may not have been involved, but it’s certainly much harder technologically for the narrow door to slowly stretch until it was wide enough for me to get the chair through. I wheeled up the ramp and onto the train. A similar thing happened as I moved down the narrow train corridor, much like being a large rat swallowed by a too small snake, the walls simply opened in front of me and then closed again behind until I reached the door of an empty compartment. As I entered the bench seat disappeared into the wall, leaving a generous space for me to sit. Around me appeared a very traditional looking reading lamp, charging points for my chair and phone, and a small table containing a small pot of tea, cream, sugar, a small plate of delicious biscuits and a selection of papers including, of course, The Daily Prophet. Train companies across the nation could learn much from this level of service. The journey passed delightfully pleasantly, at least as pleasantly as it could on a train full of excited young witches and wizards. The views were wonderful, although I have no idea where we were. There is always a unique joy to being hauled by a puffing steam train. Of course it’s a long journey to Hogsmeade so it was inevitable that at some point I’d need to use the ‘facilities’. This is something I avoid doing on trains. Even at their best train toilets are cramped, often smelly and generally unpleasant places to spend a penny, let alone time. The other problem of course is the erratic, unpredictable and sometimes violent movement of the train, which I’m sure goes some way to explain their unique ambiance. This causes me extreme difficulty. At the best of times I have the stability of a new born giraffe, so adding the movement of a cheap fairground ride is really a recipe for disaster. So it was with some trepidation that I headed towards the end of the carriage. It didn’t surprise me when the door frame bowed wide to let me through, the size of the room I wheeled into however did. It was large, much larger than the train could accommodate. The whole place smelled like a summer meadow, a real one, not the overpowering fake kind that comes out of an aerosol spray, and was laid out with everything a perfect accessible toilet should have including changing table, shower and emergency cords which reached all the way to the floor. The high contrast grab handles were exactly where I needed them, and I was left with the feeling that they magically placed themselves to perfectly accommodate whoever the current occupant was. Best of all it was clear that the room was not used for storage. There were no cleaning supplies, spare chairs or washing machines, all of which I’ve found in muggle facilities that I’ve used in the last six months. As I stood and surveyed the room I realised that it was completely, rock solid stable. All the movement of the train was missing. 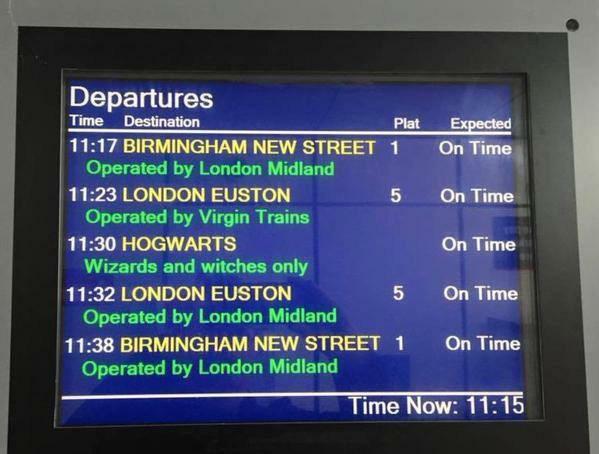 Whatever suspension or magic at work here really needs introducing on muggle trains. When we arrived at Hogsmeade I let everyone get off first. Even in the wizarding world fighting through a crush of teenagers isn’t something I particularly fancied doing. Waiting was just easier. Unlike in the UK where I have to wait for a ramp, the ramp here extended as I approached it so it was a simple process to get onto the rapidly emptying platform. So at the end of a very long and highly interesting day I’d made it to Hogsmeade. Unfortunately, and rather stupidly, I hadn’t thought about how I was going to get back. The idea of staying in the village until the train made the return journey at the end of term didn’t appeal. I have meetings to go to. Bloody brilliant. Oh! for this reality. Thank you. It was a chance to do a little ‘what if…’ dreaming. I don’t think even Crossrail will have floating trunks though! Hahahahaha oh my goodness, how did I miss this when it was first posted? Brilliant! I would love to have a train journey like that too!